Down at the dock, she made Jacob check the boat and top off the gas tank. She’d packed a cooler with fresh water and peanut butter and honey sandwiches. Elijah checked the anchor, untied the lines, pushed them away from the dock and stepped over the bow railing onto the deck. They idled as she showed Jacob how to put the boat in gear. The engine engage and they puttered forward. She pointed out important landmarks for navigating, how to differentiate high from low tide. She explained how to gauge the depth of the water in the bay based on the varying shades of greens and blues. Off in the distance, Grace pointed toward a darker patch of the bay, the shallow, sandy flats with swaying underwater fields of seagrass. Grace stepped up onto the bow and held the bow line like a rider holding a horse’s reins. Jacob accelerated and they ran parallel to the coast. Grace leaned forward adjusting her stance to accommodate for the light chop. The rhythm called back memories of a bright Miami day long ago as she raced full throttle across this same bay trying to escape her grief. There are things in life that tether us, secure us to that which we know. They are the cleats and the ropes, the anchors. 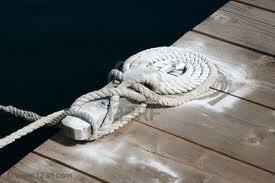 We tie up to the dock and call it home. We throw the anchor overboard and have faith it grabs the ocean floor so as to prevent the currents from pulling us out to deeper, faster more treacherous currents. But any sailor or boatman knows that a vessel tied too tightly to a dock in a marina can be submerged by rising water or dashed against its birth mates or the pier if tied too loosely. If you know foul weather is coming and you can’t get your boat out of the water and to higher ground, you tie off and leave enough rope for the anticipated rise of the sea level. But sometimes we can’t anticipate the harm coming our way. I think of the marinas in the northwest that got a slow moving 3 foot rise in sea level after the Japanese earthquake. Somethings can’t be predicted. She’d set the bottle of Jack Daniels down and untied the bow line. With one foot on the bow and one on the dock she pushed, cleaving the boat from the dock. She grabbed the bottle of liquor, clinking it hard against the metal cleat. Standing behind the console, she started the engine and shoved the throttle forward. It lifted the nose as the engine dug into the water, straining for traction. She leaned forward into the steering wheel aiming for the shallows. It was high tide. After running full throttle across the bay, she intentionally ran the boat onto Featherbed Bank, gouging into the soft swale. She cut the engine and pitched the anchor overboard. She stripped to her underwear, threw her clothes out towards the anchor, cracked the seal on the Jack Daniels and swallowed a long draught. She saw Joy sitting on the side of the boat with the sun behind her, emblazoning her silhouette like a religious icon. The smell of Joy flooded her head. It was not the smells of the hospital and sickness; it was not the sour smell Joy had all through chemotherapy. Grace smelled crisp, freckled skin freshly washed with Zest soap asleep on line dried sheets. She felt the silk of Joy’s sunstreaked and chlorine bleached chestnut hair. Grace would lie in bed curled behind her sister twirling that hair around her fingers until Joy fell asleep. Grace pulled a life preserver out of the hull, curled into the fetal position and wept. Her Joy was forever gone. She knew her parents were grief stricken but she had a massive hole in her soul, a black maw that was eating up all of her that remained. Other times you desperately want to cut your engine, pull up your anchor and simply drift. Anywhere is better than here. And fighting the current is futile. Conserve fuel, tie down everything onboard, batten the hatches and weather the storm. What anchors your life? Have your ships mates been doing their jobs and checking the equipment? Have they maintained things? Do you have enough rope, fuel and provisions? Do you know these waters and have nautical maps? It is a fearsome realization to discover that while you thought you have crew mates you really just have passengers who expect you to keep them from dying. Worse yet, you may have a ghost crew unable to lift a finger but willing to torment your sanity. And while a solo around the world adventure is a personal challenge, few people are built for the acerbic life at sea alone. When catastrophe strikes the solo sailor, so often they are beyond the easy reach of rescue. Life is a current, sometimes swift, sometimes languid. It is easy to be fooled by a smooth surface only to be sucked into a deadly undertow and drawn far out to sea. And turbulent waters can look quit dangerous but the water is turbulent because it flows over a shallow rocky bottom river no more than ankle deep in most areas. What looks safe is deadly and what looks terrifying is a kiddie pool. A good sailor, a master yachtsman, is one who comes prepared, has nerves of steel and doesn’t get sea sick easily. And they command the authority to lock the whiny passengers in their cabins and thwart any mutiny among the rank and file. If this life is your ship, are you prepared?